Let X and Y be independent random variables uniformly distributed over [0,1), and suppose our setup is symmetric between X and Y (i.e., any probabilities, conditional or not, are symmetric under interchange of X and Y). Let Z be the point in the plane with polar coordinates (r,θ)=(√X,2πY). It is easy to see that Z is uniformly distributed over the unit disc D (not including the boundary). Let A be the horizontal line segment from the center O of the disc to the right edge. The obvious answer is zero or infinitesimal. After all, Z is uniformly distributed over the disc D, and O is just one of the infinitely many points on A. But the obvious answer seems to be mistaken. Here's why. We have Z on the line segment A if and only if either X=0 (in which case, no matter what Y is, Z=O) or Y=0. We have Z=O if and only if X=0 (it doesn't matter what Y is). Let E be the event that X=0 or Y=0, i.e., that Z∈A. Then P(Z=O|Z∈A)=P(X=0|E). But surely P(X=0|E)=P(Y=0|E) by symmetry. So 1=P(X=0 or Y=0|E)≤P(X=0|E)+P(Y=0|E)≤2P(X=0|E), and so P(X=0|E)≥1/2. Thus, P(Z=O|Z∈A)≥1/2. Many of these posts on conditional probabilities, infinitesimals and uniform distribution should be going into a paper which may be entitled "In search of true uniformity." Every natural perceptual faculty we have sometimes functions veridically. We have a natural faculty of religious perception. Religious perception is always perception as of something supernatural. If a perception is as of an F, and the perception is veridical, then there is an F.
Therefore, there is something supernatural. One can always also try a probabilistic version of the argument: it is very unlikely that a faculty should never function veridically, so probably there is something supernatural. Question 1: I uniformly choose a random number X from the interval [0,1] (all points from 0 to 1, inclusive). What is the conditional probability that X is 1/9, given that X is either 1/9 or 4/9? I.e., if I receive the information that either 1/9 or 4/9 was picked, how confident should I be that 1/9 was picked? Answer? Surely, the right answer is: 1/2. Both points are equally likely. Question 2: I shoot a dart at a circular target of radius 1, with uniform distribution over the target, and I measure the distance R between where the dart hits and the center of the target. What is the conditional probability that R is 1/3, given that R is 1/3 or 2/3? Answer? 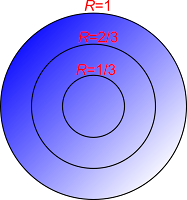 We expect this to be less than one half, because the circle of radius 2/3 is bigger. More precisely, the circle of radius R has circumference 2πR. The conditional probability of being on some circle, given that one is on one of two circles, is presumably proportional to the circumference of the relevant circle. Thus: P(R=1/3|R=1/3 or R=2/3)=2π(1/3)(2π(1/3)+2π(2/3))=1/3. Let's now go back to Question 1. The only thing I stipulated was that X is uniformly distributed over [0,1]. Well, we've seen that Y is uniformly distributed over [0,1]. So, what we said about X's conditional probability should hold for Y. Thus, the conditional probability of Y being 1/9 given that it's 1/9 or 4/9 should be 1/2. But let's see: P(Y=1/9|Y=1/9 or Y=4/9)=P(R=√(1/9)|R=√(1/9) or Y=√(4/9))=P(R=1/3|R=1/3 or R=2/3), by definition of Y. But we've already worked out the latter conditional probability as the answer to Question 2: it's 1/3. Well, we're conditioning on events of zero probability. That's fishy. One thing we could learn from this story is that saying that some measurement is uniformly distributed in the sense in which that's normally understood does not convey all the relevant information about that measurement. For to compute conditional probabilities on null sets, one needs more information on how the "uniform" measurement was generated. For if it was generated as the square of the distance from the center of our target of unit radius, the conditional probabilities will be different than if it is generated in a more truly uniform manner. It is tempting to say that true uniformity of a number in [0,1] requires that the Popper function associated with the process be invariant under isometries, in this case translations. That's fine in one dimension, but in three dimensions such strong isometric invariance cannot hold. A different move is simply to admit that the notion of conditional probability just doesn't make sense when we're conditioning on sets of measure zero. Sure, we can sometimes talk about what credences it would be rational to give in some condition, where that condition has null probability. But that is a matter of rationality, not of formal probability theory. I've previously made this point with infinitesimals. If presentism is true, future events are not real. It is not rational to trade a real good event for a non-real event. It is rational to trade a small present good event for a great future good event. Present good events are real. Franciscan University of Steubenville has posted my talk on sexual ethics on YouTube. The talk gives some of the central ideas of my One Body book. According to best-systems accounts of laws, the laws are the theorems of the best system correctly describing our world. The best system, roughly, is one that optimizes for informativeness (telling us as much as possible about our world) and brevity of expression. Now, suppose that there is some dimensionless constant α, say the fine-structure constant, which needs to be in some narrowish range to have a universe looking like ours in terms of whether stars form, etc. Simplify to suppose that there is only one such constant (in our world, there are probably more). Suppose also, as might well be the case, that this constant is a typical real number in that it is not capable of a finite description (in the way that e, π, 1, −8489/919074/7 are)—to express it needs something an infinite decimal expansion. The best system will then not contain a statement of the exact value for α. An exact value would require an infinitely long statement, and that would destroy the brevity of the best system. But specifying no value at all would militate against informativeness. By specifying a value to sufficient precision to ensure fine-tuning, the best system thereby also specifies that there are stars, etc. Suppose the correct value of α is 0.0029735.... That's too much precision to include in the best system—it goes against brevity. But including in the best system that 0.0029<α<0.0030 might be very informative—suppose, for instance, that it implies fine-tuning for stars, for instance. But then on the best-systems account of laws, it would be a required by law that the first four digits of α after the decimal point be 0029, but there would be no law for the further digits. But surely that is wrong. Surely either all the digits of α are law-required or none of them are. One should not assign a different probability to A than to B. One should assign the same probability to A as to B. From (2), the Principle of Indifference follows: if it's certain that exactly one of A1,...,An happened, and the epistemic situation is symmetric between them all, then by applying (2) to the different pairs, we conclude that they all have equal probability, and since the probabilities must add up to one, it follows that P(Ai)=1/n for all i. But while (1) is very plausible (notwithstanding subjective Bayesianism), (2) does not follow from (1), and likewise Indifference does not follow. For (1) is compatible with not assigning any probability to either A or B. And sometimes that is just the right thing to do. For instance, in this post, A and D are on par, but the argument of the post shows that no probability can be assigned to either. One should treat A probabilistically on par with B. If one of the two has a probability, the other should have a probability, and the same one. If one of the two has an imprecise probability, the other should have one, and the same one. If one is taken as maximally nonmeasurable, so should the other one be. And even facts about conditional probabilities should be parallel. Nonetheless, there is a puzzle. It is very intuitive that sometimes Indifference is correct. 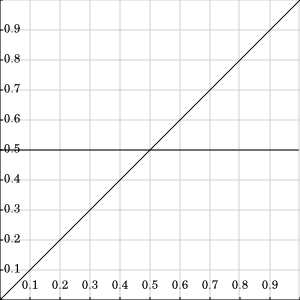 Sometimes, we correctly go from the fact that A and B are on par to the claim that they have the same probability. Given (1) (or (3)), to make that move, we need the auxiliary premise that at least one of A and B has a probability. According to subjective Bayesianism, the only constraints on prior probabilities are that they be consistent and, for contingent events, strictly between 0 and 1. But this makes it too easy to be within one's full epistemic rights in believing really silly stuff with no evidence whatsoever, just by having assigned it a high prior. Perhaps what the subjective Bayesian needs to do is distinguish epistemic permissibility, which one can have without evidence, from epistemic justification, which requires some evidence. I doubt that the subjective Bayesian is going to be able to run a good story here that's consistent with the subjective elements. After all, there are many silly things that we are justified in disbelieving precisely because of their low priors and despite there being evidence for them, such as the law of gravity that says F=Gmm'/r2+a, where a=10−1000000, a law that we actually have a lot of evidence for—any evidence we have for Newton's law of gravitation is also evidence for this law, since the two laws are experimentally indistinguishable—but which we rightly disbelieve precisely because of low priors. The Bayesian needs non-subjective priors. If mereological universalism holds, then for any predicate F that is satisfied by an object, there is a mereological sum of all the objects that satisfy F.
If Platonism is true, then for any object x there is a property Ux such that (a) x has Ux, (b) nothing else has Ux, and (c) Ux does not have mereological parts. Call any such a property an "identity of x". 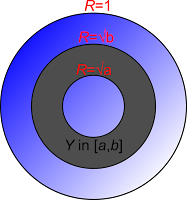 Condition (c) is probably satisfied by all properties, but I could imagine someone thinking that conjunctive properties are mereological sums of their conjuncts, so (c) would be needed to rule out conjunctive properties (and if Vx is a conjunctive property satisfying (a) and (b), then we can let Ux be the property of having Vx or being a unicorn, and this won't have mereological parts). Assume Platonism and mereological universalism. For any predicate G(x), say that IG(P) if and only if P is an identity of an object x such that G(x). For any object S, say that x∈S if and only if an identity of x is a mereological part of S. Then by (1) and (2), for any predicate G that has at least one satisfier there is an object M such that x∈M if and only if G(x). Just let M be any mereological sum of all the objects satisfying IG (to get that if x∈M, then G(x), note that it follows from (c) that no identity can overlap more than one identity). But now we have a contradiction. Let G(x) be the Russell predicate not(x∈x). Then G has at least one satisfier: e.g., you satisfy G. So there is an M such that x∈M if and only if G(x). So, M∈M if and only if not(M∈M), a contradiction. So, our Platonist mereological universalist needs to restrict her universalism to concrete objects or something like that. Lewis's Parts of Classes is no doubt relevant, and what I said above may well overlap with Lewis (I haven't actually read that book--just ordered from Interlibrary Loan). 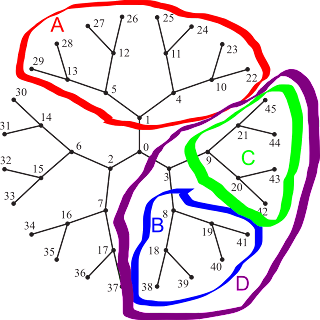 Suppose you're one of the nodes of this infinite tree, cut off for the purposes of the diagram, but you have no information whatsoever on which node you are. Region A is exactly like region B. And region B is exactly like region C.
So that you're in D must be at least as likely as that you're in B or C, but that you're in B is just as likely as that you're in A, and ditto for being in C. Hence that you're in D is at least twice as likely as that you're in A. But that you're in D obviously has the same probability as that you're in A. Thus, P(A)=P(D)≥2P(A). Hence P(A)=0. But of course the whole tree is equal to three copies of A, plus the point 0. So if you can assign probabilities, then you're certain to be at 0. Which is absurd, especially since you can recenter the graph at another point and run the argument again. Philosophically, this is a nice illustration of the severe limits to probabilistic reasoning. My eight-year-old son is looking at what I'm posting and says: "It's just probabilities and I'm not going to use probabilities on this tree. It's obvious." He wonders why I am posting such obvious things. Mathematically, all that this displays is that of course there is a paradoxical decomposition of a regular tree, and hence that there is no finitely-additive symmetry-invariant probability measure on a regular tree. For most of the week I was at the Santa Cruz Philosophy of Cosmology institute. Thursday I gave a talk on the Principle of Sufficient Reason and on the measure problem in cosmology for multiverses. These talks and many talks by smart people are available here. Click on "Program", then scroll down close to the bottom to Thursday 7/11 if you want mine. Or just click right here for part 1 and part 2 of my talk on Youtube. Here are the slides to part 1 (cosmological argument) and part 2 (measure problem). Why prefer simple and elegant theories? pragmatic: simple theories are easier to work with. aesthetic: just as it's better to hang around beautiful places, it's better to hang around beautiful theories. This is mainly a tongue-in-cheek suggestion. I definitely think, in part for theistic reasons, that truth is the right answer. C quasi-deterministically causes E iff necessarily either C causes E or C does not cause anything. Now, quasi-deterministic causation of actions by reasons is compatible with libertarian views of freedom. Moreover, quasi-deterministic causation provides something like contrastive explanation of the effect. Thus, libertarian views of freedom are compatible with something like contrastive explanation of actions. There are two devices, A and B, each of which generates an independent uniformly distributed number between 0 and 1. You have a choice between two games. Game 1: You win if B generates the number 1/2. Game 2: You win if B generates the number generated by A. Perhaps you say: "I don't care. I have infinitesimal or zero probability of winning." To make you care, suppose the game is free but the payoff is infinite. Intuitively, you're equally likely to win either game. There is no reason to choose one over the other, given that the two devices are independent. It's no easier or harder to get 1/2 than to get whatever number A generates. But there is another way of seeing the situation. Graph the state space of the game with the x-coordinate corresponding to A and the y-coordinate corresponding to B. The state space is then the unit square. 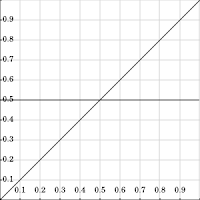 But on Game 1, the victory region is a horizontal line y=1/2 while on Game 2, it is the diagonal line y=x. But the diagonal line has the square root of two, approximately 1.414, as its length, while the horizontal line has unit length. So you should choose Game 2. I have tried three times before to formulate a paradox that comes up when countably infinitely many people roll dice, looking for the most compelling version. Let me try one more time. You observe Jones participating in the following game. She rolls a die, but doesn't get to see the result. Over the next six days, on day n she is said to be a winner if n is what she rolled. Thus, Jones will be a winner on exactly one of the next six days. Only after the end of the six days will Jones find out on which day she was a winner. Let's say it's now day n. What's the probability that Jones is a winner now? Surely it's 1/6. But now you find out that infinitely many people independently participated in this game. And that, completely unsurprisingly, each of the possible six die outcomes were had by infinitely many players. On any given day, every player is paired with some other player. No player is ever paired twice with the same player. A winner is always paired with a loser. So, it's day n, and you observe Jones and Smith paired together. What probability should you assign to Jones being a winner? Suggestion 1: Jones and Smith are exactly on par, so you should assign equal probability to each being the winner. So you assign 1/2 to each. But now repeat this every day. By the same reasoning, on each of the six days, you have probability 1/2 that Jones is the winner on that day. But you can't assign probability 1/2 to Jones being the winner on each of the six days, since Jones is certain to be the winner on exactly one of the six days, and so your probabilities will be inconsistent. Suggestion 2: Stick to your guns. Assign probability 1/6 to Jones being the winner. But what goes for Jones goes for Smith. So you should assign 1/6 to Smith being the winner. But this probability assignment is inconsistent as well, since it's certain that one of the two is the winner. Well, that didn't work out too well, did it. Maybe it's time to get a bit more elaborate in our suggestons. Suggestion 3: Constantly shifting probabilities. Let's say on day 1 you observe Jones and Smith paired together. You assign 1/2 to each being the winner on day 1. Then on day 2, you observe Jones and Kowalska paired together. You likewise assign 1/2 to Jones being the winner on day 2. But since you're not certain that Jones didn't win on days 3,4,5 or 6, you downgrade your probability that Jones won on day 1. I don't know what you do about days 3,4,5 or 6. But what do you do about Smith? On day 2, you observe Smith and Ahsan paired together. If you downgraded your probability that Jones was the winner on day 1, you should also downgrade your probability that Smith was. But that results in inconsistent probabilities, too. Moreover, this suggestion crucially depends on the days being sequential. But we can come up with a variant story on which all the pairings are simultaneous. For instance, let's suppose that the organizers put strings, with attached tags printed 1,2,3,4,5 or 6, between pairs of participants—a nasty tangle of them—with the property that each participant has six strings attached to her, with the property that the string tagged n joins a participant who rolled n with one who didn't, and that each participant has coming out of her strings numbered 1,2,3,4,5 or 6. Jones and Smith have string number 1 joining them. What's the probability that Jones rolled 1? The same issues come up, but simultaneously. Suggestion 4: No numerical probabilities. Once you see the pairings, you no longer assign numerical probabilities to who is the winner when. Perhaps you assign interval-valued probabilities, presumably assigning the interval [1/6,1/2] to each ``x is a winner on day n'' hypothesis. Or perhaps you have no probability assignments, simply sticking to non-probabilistic claims like that Jones is a winner on exactly one of the six days, and ditto Smith, and Jones is a winner on day 1 if and only if Smith is not a winner on day 1. This may be what we have to do. It tracks the fact that the most obvious ways to arrange a pairing satisfying (1)—(3) all require a numerical ordering on the participants, and we are given no information about such numerical orderings, but there is no meaningful uniform probability distribution over infinite orderings. But Suggestion 4 doesn't come cheap, either. We still have to answer questions about what bets are prudent under the circumstances. Moreover, we have to ask at which stage of the experiment you drop your numerical probabilities. The radical suggestion is that you do so when you find out that there are infinitely many die rollers. This is radical: it means that we can't do epistemic probabilities if we know we live in a universe with infinitely many die rollers. That may be true (and if true, it means that scientific arguments for an infinite multiverse are self-defeating), but it's really radical. The less radical options are: (a) drop your numerical probability assignments, say for Jones, when you find out that a pairing satisfying (1)—(3) will actually be announced and (b) drop your numerical probability only when you actually see the pairings. I think (a) might actually be better. For as soon as you know that such a pairing will be announced, you can stipulate a name, say "JonesPair1", to refer to the first person that Jones will be paired with. And it would be odd if you then changed your probabilities for Jones and JonesPair1 on day 1 just because you found out that JonesPair1 had the legal name "Smith", that she was female, etc. It is wrong to hate a creature of God. It is wrong to hate God. Everything is either God or a creature of God. So there is nothing which it is permissible to hate. But on the other hand, surely one should hate sin, vice, war, divorce, etc. (Note that one can say this even if one thinks that sometimes war and divore are permissible.) Thus there must be a sense in which sin, vice, war and divorce do not exist. In the case of sin and vice, and maybe divorce, this is handled by Augustine's old move: evils are privations. But war is not a privation, though it involves privations. So our initial argument teaches us some ontology. It must be true to say that war does not exist. For this ontology not to be ad hoc, I think we need to say that there are no such things as situations, non-abstract states of affairs or events. Of course, we still have to be able to say things like: "There are wars and nuclear weapons." So we need a way of using existential language that isn't tied closely to the correct ontology. There is a countably infinite number of red-shirted people and a countably infinite number of blue-shirted people. On Sunday, each of them rolls a die marked "Monday", "Tuesday", "Wednesday", "Thursday", "Friday" and "Saturday", but none of them get to see the result of the roll. It is made sure that each of the 12 possible shirt-color and day combinations is realized in infinitely many cases--if not, the rolls are repeated. For the next six days, on each day they are paired up, in such a way that a red-shirt and a blue-shirt are together taken into a room with a TV. Every red-shirt is paired with a blue-shirt and every blue-shirt is paired with a red-shirt. Moreover, the pairings change every day, so nobody is paired with the same person twice. Now, the TV is connected to a camera, which either points at the Mona Lisa or at a perfect fake of the Mona Lisa. But there is a crucial difference between the red-shirts and the blue-shirts. The red-shirts are shown the real Mona Lisa on the day shown on their die, and the fake one on the other five days. The blue-shirts are shown the fake Mona Lisa on the day shown on their die, and the fake one on the other five days. Everybody knows these rules. No other information is available. Oh, and there is no conceptual difficulty in setting up these pairings if you have an infinite number of people and rooms. Let's say it's Saturday. Then you have four infinite sets: red-shirts who need to be shown the real Mona Lisa, blue-shirts who need to be shown the real Mona Lisa, red-shirts who need to be shown the fake Mona Lisa, blue-shirts who need to be shown the fake Mona Lisa. You also have some exception rules: for each person, there are now four people they're not allowed to be paired with. No information is available to the participants on how the pairings are arranged. You're one of the red-shirts. You're in a room with a blue-shirt. What are your probabilities that you're looking at the real Mona Lisa? The plausible answer seems to be 1/6. But if you say that, then by parity you should say that for the blue-shirt with you, it's 5/6. Now, you and the blue-shirt get talking. You exchange names, you talk about what you saw on the preceding days. Eventually, you have all the same information. And let's even suppose that all the people in the experiment have the same priors and that they weigh evidence according to the same rational rules. At this point, either your probabilities will become the same or they will stay different. If they stay different, then we have a nice argument that it's possible to have two people with exactly the same information, the same priors and the same rules of judgment who disagree. That's an interesting conclusion. If they become the same, there are two reasonable possibilities. Maybe they become 1/2. Suppose now that everybody is offered a bet where you get $3 if it's the real Mona Lisa and $2 if it's the fake, where the bets are all going to be settled up at the end of the experiment. If your probabilities have changed to 1/2, you will take the bet, and then by the end of the experiment, given that you're a red-shirt, you will have received $3 and paid out $8. Oops. The other possibility is that they become an interval of probabilities, presumably [1/6, 5/6]. But that doesn't reflect the fact that there are perfectly clear answers to how you should bet. As the above example shows, clearly you should be betting according to a 1/6 probability of the Mona Lisa. So, it seems that you need to stay at 1/6. We do get an interesting conclusion about disagreement, but maybe it's not absurd. Alright, but now let's complicate the matter. You're an intelligent fly on the wall in one of the rooms on Monday. You know all the above rules, but otherwise nothing more than any of the participants. A red-shirt and a blue-shirt come in. What is your probability that it's the real Mona Lisa on the TV? Surely either 1/2 or [1/6, 5/6]. But then you learn that there is a rule for flies, too. A fair coin is tossed for you. If it's heads, you are assigned to follow the red-shirt for the rest of the week, and if it's tails you are assigned to follow the blue-shirt for the rest of the week. But it's heads and this is announced to you. At this point, your lot is exactly like the lot of this red-shirt. You will see the real Mona Lisa on exactly one out of six days. But it's still Monday. You've learned something: the coin is heads. Should you change your probability for whether it's the real Mona Lisa? Presumably not, since in learning that the coin is heads you've learned something that's independent of the die rolls that determine whether it's the real Mona Lisa. But how are you relevantly different from the red-shirt that you're following? The main difference is that the red-shirt presumably knew she was a red-shirt before she came into the room, while you didn't know that you were assigned to a red-shirt until you came into the room. But surely the order in which you've learned these things doesn't matter. So it seems that your probabilities should be the same as the red-shirt's. And so they should switch to 1/6 when you learn the coin is heads. Which is absurd. The principle that <There exists (tenseless) at least one F>, or equivalently, <There ever is an F>, is grounded in <A is an F> for any A is widely held but somewhat controversial. I think it's false in general myself, but there seem to be clear cases. For instance, <There exists at least one turtle> is surely grounded in <Tim is a turtle> and in <Jen is a turtle> and in similar statements for any turtle. It is possible for a proposition to ground another proposition without explaining it. A similar point can be made with disjunctions. Suppose you see Sam eat a slug. You ask her why she did that. She says she did it because she chose to. You then ask: "But why did you do it or choose to do it?" And certainly that she chose to do it is not an answer to this question. But that she chose to do it does ground that she did it or chose to do it. One might of course deny even the seemingly innocent cases of existential and disjunctive grounding that I rely on here. Perhaps when both disjuncts are true or several things exist, the standard disjunctive or existential grounding principles are false? P(B|B)=1 for all B in F−N. The sets in N can be called negligible or trivial or null. Any Popper function restricts to a pre-Popper function if we let N be the set of all subsets B such that P(∅|B)=1. A pre-Popper measure is a pre-Popper function such that F is a σ-field and P(−|B) is a countably additive probability. The results I've been advertising so far for Popper functions and measures in fact hold for pre-Popper ones. Say that P is invariant under a set G of transformations of some space X containing Ω provided that N is invariant under G and P(gA|gB)=P(A|B) for all g in G, A in F and B in F−N. 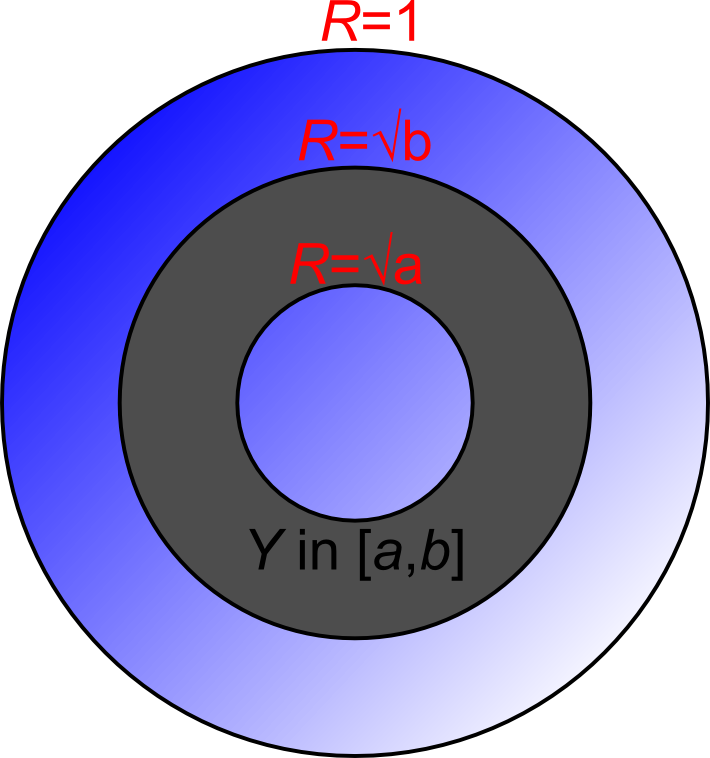 Suppose Ω is a subset of Rn, n≥3, such that Ω has non-empty interior, and G is the rotation-and-translation group in Rn. Then if F contains all countable (respectively, Lebesgue null) subsets of Ω, then (a) some countable subset of Ω is P-trivial, (b) every finite subset of Ω is P-trivial, (c) every line segment in Ω is P-trivial, and (d) given the Axiom of Choice, every countable (respectively, Lebesgue null) subset of Ω is P-trivial. Suppose Ω is the sphere Sn (i.e., the surface of an (n+1)-dimensional ball), n≥2, and G is all rotations. Then if F contains all countable (respectively, Lebesgue null) subsets of Ω, (a), (b), and (d) from (1) hold. Suppose P is a Popper measure, Ω=[0,1)2 and G is all translations (modulo 1 in each coordinate). Any line segment in F is P-trivial. If F contains all finite infinitely differentiable curves, then all such curves are P-trivial. The lesson is that Popper functions really don't help much with the problem of conditioning on measure zero sets. Too many measure zero sets are trivial. I took my Panasonic DMC-G1 camera, set it on the widest setting, focused on something lit up in the distance, set it on manual, maximal aperture, 14mm F/3.5 setting on the 14-45mm lens, 30 second exposure, and put it upside down a table on our balcony. I was surprised how much more you see than with the naked eye. Here's the result (with the slightest bit of editing to crop and to darken the sky). 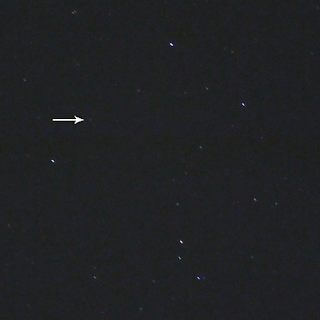 At 30 seconds, even at this low, low magnification, star trails start. Guise theorists think that "London is beautiful" and "Londres est belle" express the same proposition, but under two different guises. That's what makes it possible for Pierre to affirm the first statement (he does so under the "London" guise) while denying the other (under the "Londres" guise), without being irrational, if he doesn't know that London is Londres. An omniscient being is one that knows every truth and believes only truths. An omniscient being is one that knows all truths under all their guises and believes only truths. An omniscient being is one that knows every truth under some guise or other and believes only truths. Now, (3) seems insufficient for characterizing omniscience given guise theory. Suppose Pierre thinks that London is beautiful, but suspends judgment over whether Londres est belle. Surely his ignorance of whether Londres est belle suffices to render Pierre non-omniscient, even though he does believe the relevant proposition under some guise. If we take (2), however, then we get an interesting result: If there is an omniscient being, there are no creaturely essentially private guises. An essentially private guise would be one that only one individual can believe something under. A creaturely one would be one where that individual is a creature. For if there were any creaturely essentially private guises, there would surely be some truths under them, and so by (2) God would know these truths under these guises, contrary to the privacy of the guises. The most plausible kind of private guise would be "I". One might think that if I believe that I now typing, while you can believe the same proposition that I believe, you cannot believe it under the same guise. To believe it under the guise corresponding to "He is now typing" or "Alex is now typing" is to believe it under a different guise. Otherwise guise theory can't solve the Pierre problem. For it is possible for me to believe that I am now typing without believing "He (Alex) is now typing" or "Alex is now typing". If (2) is true and there is an omniscient being, then "I" is not an essentially private guise. That is surprising. Moreover, one might think that there are guises which are essentially tied to certain experiences. Suppose I am suffering an odd pain. I believe the necessary truth "This is a pain" where the "This" refers to the pain under a guise whose grasp by me depends on my actually having or remembering a pain like that. If a being exists that is essentially omniscient, doesn't necessarily suffer and essentially lacks false memories, then such a being would have to be able to grasp "This is a pain" propositions under such pain-guises without either having the pains or remembering them. So adopting (2) leads to surprising consequences for guise theory. Given the plausibility of the possibility of an omniscient being, this is a problem for guise theory. Is there an alternative to (2) and (3)? Maybe one could say that an omniscient being knows truths under some divine guises which are richer than the guises under which we know things. Thus, perhaps God doesn't know that I am typing and that this is a pain under the guise under which I know it, but he knows them under a richer guise. The challenge here would be to try to work out what the greater richness of guise could be, without it being some kind of inclusion of the more private-seeming guises. Of course, one could adopt (2) and simply accept the surprising consequences. Surprising consequences may be some evidence against a theory, but they can be far from refuting it. Nor will abandoning guise theory get out of these problems. Guises were introduced to solve certain problems, like how it is possible to rationally believe "I am now typing" without believing "Alex is now typing" (say, I've forgotten my name). These problems still need a solution. A Fregean solution will say that all these sentences express different propositions. Fine. But the intuitions that supported privacy of some guises will now support the privacy of the corresponding propositions. So, the existence of an omniscient being shows that some things that seemed to be private aren't. This is just a quick technical note. Feel free to ignore. Bas van Fraassen defines a Popper probability measure as a Popper probability function that is defined on a σ-field and such that P(−|B) is a countably additive probability measure for any non-negligible B. We can say that B is negligible provided that P(∅|B)=1. One might hope to define a Popper probability function on, say, [0,1]2 such that if B⊆[0,1]2 is a closed non-self-intersecting smooth curve of non-zero length then B is in our σ-field, is non-negligible and P(−|B) is normalized Lebesgue length measure for Borel subsets of B. Unfortunately, we can't do this. For consider the infinite-length non-self-intersecting curve B defined in polar coordinates by r=1−1/θ, for θ≥1. This would be non-negligible because finite subcurves of it would be non-negligible. Now chop up B into a sequence of curves of unit length each: B1,B2,.... At least one of these has non-zero probability given B, by countable additivity of P(−|B). But by the Lebesgue length measure condition and Popper function axioms, they must all have the same probability given B. And that will violate additivity of P(−|B). I suspect that Popper probability measures aren't very interesting: there is too much that ends up negligible, thereby not making much of an improvement over ordinary probability measures. I just unfriended my remaining three Facebook friends. If you were one of them, please take no offense. Facebook friendship isn't friendship, and Facebook unfriending isn't the termination of a friendship. What prompted this was an email from Facebook about 82 friend requests. These are all being ignored, so if you're among the 82, also please take no offense. I want to have friends but not Facebook friends. I don't use Facebook almost at all. I much prefer ordinary email for private stuff and blog discussion for public stuff. I need to keep a Facebook account, however, if only because there are a few businesses and other organizations that have no way of being electronically contacted except through Facebook.